Recent advances have been made in the scientific understanding of how diet and specific foods within a balanced diet promote human health and prevent chronic illnesses such as cardiovascular diseases, cancers, and neurodegenerative disorders. Not surprisingly, consumers are turning toward foods with medicinal properties as promising dietary interventions for disease prevention and health maintenance. As part of this trend, interest in the Mediterranean diet (MD)1 and specific foods that are integral to this diet have grown significantly. A common feature of the MD is a high consumption of olives and olive oil as the primary sources of dietary fat. While scientific research is continuously finding new health benefits of olive oil, people throughout history have been using it for a wide range of therapeutic and culinary uses. Folk medicine valued it for assisting with digestion, mitigating the effects of excess alcohol consumption, reducing muscle aches, and maintaining skin, hair and muscle health. Olive oil was also used as an aphrodisiac, laxative, sedative and a tonic to treat ailments as diverse as colic, paralysis, rheumatic pain, hypertension and sciatica. History and science increasingly support the myriad health benefits of consuming olive fruit and its oil, particularly as part of a balanced diet. Traditional Mediterranean diets are rich in plant foods (vegetables, fruit, grains, seeds and nuts), olives and olive oil, and low in saturated animal fats. The work of epidemiologist and nutritionist Ancel Keys was among the first scientific research to help popularize the MD. In 1952, based on the low rates of heart disease in the Mediterranean region, Keys and his colleagues began a series of investigations of dietary and other coronary risk factors in seven countries, including Finland, Greece, US, Italy, Yugoslavia, Netherlands and Japan. The research investigated links between coronary heart disease mortality and lifestyle factors, especially the intake of monounsaturated and saturated fats. With respect to many health concerns, type of fat is crucial. While saturated and trans fats are considered to be bad fats, monounsaturated fats are considered to be good fats. Olive oil, the main type of fat in the MD, is high in oleic acid, a monounsaturated fatty acid (MUFA). MUFA are less susceptible to oxidation, and this contributes to the stability and long shelf life of olive oil. While the protective effects of MUFA in olive oil are well documented, oleic acid is not the only health protective component of olive oil.3 Other active components include hydrocarbons (as squalene), sterols (as β-sitosterol), polyphenols (tyrosol, hydroxytyrosol, oleuropein and many others), tocopherols, terpenoids, and traces of other constituents.4 Olive oil compounds have bioactive properties as far ranging as anti-inflammatory, antioxidant, antiarrhythmic, and vasodilatory effects.5 Research also confirms that olives and olive oil affect health through multiple mechanisms. Chronic maladies associated with aging—including heart disease, cancer, cardiovascular disease, and cognitive decline—are adversely stimulated by oxygen damage (oxidative stress). Consumption of antioxidant-rich food provides significant protection against disease. Olives and olive oil are rich sources of antioxidants. Hydroxytyrosol is a powerful antioxidant that has been the subject many research studies and has shown several biological properties, particularly anti-inflammatory, antifungal, antiviral and antibacterial activities. The additive and synergistic effects of phytonutrients in fruits and vegetables are responsible for their potent bioactive properties, and the benefit of a diet rich in fruits and vegetables and olive oil is attributed to the complex mixture of phytonutrients present in whole foods. No single food or extract can replace the combination of natural phytonutrients found in the MD, but olives and olive oil offer many unique and powerful health-promoting components. The most robust research on olive oil has been its effect on cardiovascular disease (CVD), the leading cause of death worldwide. Several biochemical and metabolic studies add evidence to the cardiovascular protective effect of olive oil, strongly attributed to oleic acid and antioxidant polyphenols. Beyond the reducing low-density lipoprotein (bad) cholesterol (LDL) and increasing high-density (good) cholesterol (HDL), olive oil improves many additional risk factors for cardiovascular disease, including blood pressure, glucose metabolism and antithrombotic proﬁle. Endothelial function, inﬂammation and oxidative stress are also positively changed. LDL oxidation plays a critical role in the development of atherosclerosis and coronary heart disease. While many studies have compared the effects of diets rich in MUFA on LDL oxidation and found a protective role, there are other mechanisms at work. Phenolic compounds in olive oil show powerful antioxidant properties against LDL oxidation.7 Results of the EUROLIVE study provide additional evidence of the many antioxidant properties of phenolic compounds.8 The EUROLIVE study was a large, crossover, multicenter clinical trial performed on 200 people from 5 countries in Europe. Subjects who consumed high phenolic olive oil had decreased LDL/HDL cholesterol ratios and LDL oxidation. Olive oil may also be more effective than drugs at reducing heart disease by reversing atherosclerosis in carotid arteries. A study involved 187 participants with a high cardiovascular risk and over the age of 55. The participants were divided into 3 groups. Two of the groups received instruction and support on following an MD. Participants in one of the groups consumed 10 tablespoons of olive oil per day for a year, the other consumed 30 grams of nuts per day. The third group was instructed to follow a low fat diet. All participants were measured for the thickness of carotid artery at the beginning of the study as well as at the end of a year. The participants who had followed the MD with olive oil or nuts and who had suffered the greatest thickening of the artery because of atherosclerosis showed a significant improvement and regression of lesions.13 One of the more intriguing findings of this study was that changing an entire diet was able to accomplish in one year what pharmaceutical intervention was not able to achieve in 2 years. The results were part of the PREDIMED study, a large, multi-year clinical study on nutrition and CVD with 7,447 participants. Additional and final results of the study will be available in 2012. Type 2 diabetes is the most common and most preventable kind of diabetes. Being overweight, obese and having metabolic syndrome are serious risk factors that can be modified by diet and lifestyle changes. Results from epidemiological studies show the beneficial effect of the Mediterranean dietary pattern on diabetes mellitus and glucose metabolism in general. According to a large study of 13,380 Spanish university graduates, a traditional Mediterranean food pattern was associated with a significant reduction of 83% in the risk of developing type 2 diabetes.17 Clinical studies also support the positive effect of olive oil on type 2 diabetes; a study of 418 people showed that a MD rich in olive oil reduced type 2 diabetes by almost 50% compared to low fat diets. Study participants were randomly assigned a MD with olive oil, a MD with nuts or a low fat diet. After the 4-year trial period, 18% of the individuals following the low fat diet developed type 2 diabetes; only 10% of the participants following the Mediterranean with olive oil diet developed the disease.18 The MD and olive oil may also affect type 2 diabetes and metabolic syndrome by helping with weight loss and/or maintenance. The oil’s palpability facilitates eating vegetables. Oleic acid may also influence satiety (a feeling of fullness) and help to reduce food intakes. Further data on olive oil’s impact on CVD comes from a study on stroke prevention. Data from the Three Cities Study found that elderly people who consume olive oil daily have fewer strokes than those who do not. Researchers analyzed medical information from 7,625 individuals over the age of 65 from three cities in France: Bordeaux, Dijon and Montpellier. None of the participants had a history of stroke. They then categorized the individuals into three groups based on their olive oil consumption: “no use,” “moderate use” (using olive oil in cooking or as dressing or with bread), and “intensive use,” (using olive oil for both cooking and as dressing). After 5 years, there were 148 incidents of stroke. Analysis of the data demonstrated that “intensive” users of olive oil had a 41% lower risk of stroke compared to those who did not use olive oil at all.19 These results were consistent even after considering weight, diet, physical activity and other risk factors. 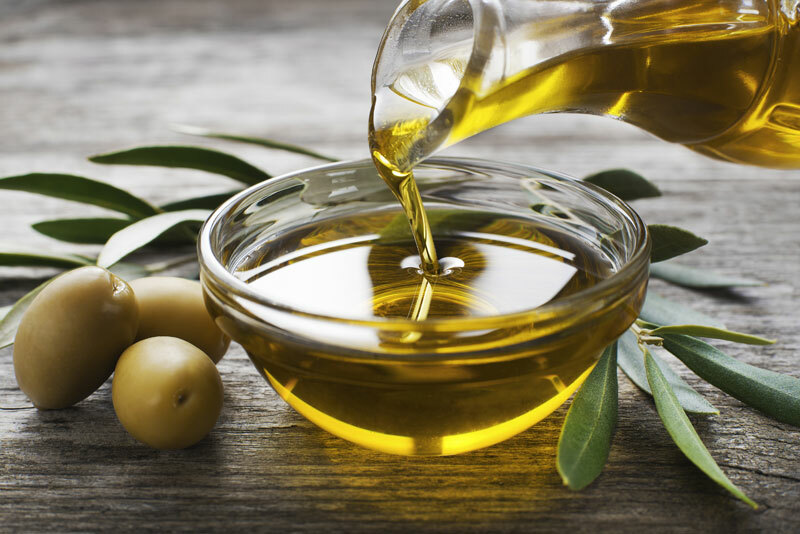 The agency’s scientific panel of experts based their conclusion on data published in one large study and two smaller scale studies, each of which showed a dose-dependent and significant effect of olive oil-derived hydroxytyrosol on the lowering of oxidized LDL (“bad cholesterol”). A minimum of 5 mg of hydroxytyrosol must be contained within the food product in order to carry the heart-health claim. Rates of skin cancer are lower in populations that follow a traditional MD than those that don’t. The high content of squalene in olive oil may be responsible. Compared to most other foods, olive oil has a very high level of squalene; olive oil has 0.7% squalene, while most other foods range between 0.002 and 0.003%.34 While squalene is disbursed throughout the body, the majority is transported to the skin where it may provide a chemoprotective effect.35 Squalene may also provide protection against many other forms of cancer. Scientific research increasingly links excess body fat, obesity, metabolic syndrome and inflammation as major risk factors for cancer. The Mediterranean dietary pattern and exercise may also protect against cancer by helping to maintain a healthy body weight. High consumption of vegetables and fruit accompanied by moderate consumption of olive oil, olives and nuts are connected to improved health, including weight management and reduction. Many diseases are associated with low-grade inflammation triggered and sustained by oxidative stress. A growing body of research supports that chronic inflammation is the root cause of major illnesses such as neurological disorders (including Parkinson’s and Alzheimer’s disease), obesity, metabolic syndrome, cardiovascular disease, diabetes, arthritis and cancer. As a result of this understanding, professionals in the medical community are embracing anti-inflammatory diets as a key ingredient to promoting healthy aging, delaying the onset of age-related illnesses and promoting optimum health at any age. The MD in general and olives and olive oil in particular have numerous anti-inflammatory properties. Increased olive oil consumption has been linked with a decreased risk of developing rheumatoid arthritis, an autoimmune disease characterized by inflammation and pain, particularly in the joints.36 A clinical trial revealed that rheumatoid arthritis patients who supplemented their diets with olive oil and fish oil experienced greater improvements in clinical measurements of the disease than did patients who supplemented with fish oil alone.37 These observations suggest that olive oil could help prevent rheumatoid arthritis and may restore mobility and function in those already affected by the disease. One reason that olive oil helps to prevent inflammation may be that its phenolic compounds modify genes involved in inflammatory response. In a multi-institute study, including the University of Cordoba and the USDA Research Center on Aging, researchers fed 20 volunteers with metabolic syndrome breakfasts with olive oil. After tracking the expression of more than 15,000 genes in mononuclear blood cells after the meals, researchers found that 79 genes are turned down and 19 are turned up by high phenolic olive oil.38 Many of the genes that were turned down have been associated with inflammatory conditions like obesity, heart disease, high blood lipids and diabetes. The study offers a molecular explanation for diseases linked to inflammation. Olive oil contains oleocanthal, an in vitro cyclooxygenase inhibitor with potential anti-inflammatory and analgesic properties similar to the non- steroidal anti-inflammatory drug ibuprofen. Ibuprofen reduces the risks of some cancers and platelet aggregation. Oleocanthal may offer special protection against Alzheimer’s disease. A laboratory study found that oleocanthal beneficially alters the structure of neurotoxic proteins believed to contribute to the debilitating effects of Alzheimer's disease.39 The structural change impedes the ability of highly toxic proteins known as ADDLs to damage brain nerve cells. ADDLs bind within the neural synapses of the brains of Alzheimer's patients and are believed to disrupt nerve cell function, eventually leading to memory loss, cell death and global disruption of brain function. Emerging research indicates that olive oil consumption helps to prevent osteopenia, inflammation-induced loss of bone mineralization. Osteopenia is a prelude to full-blown osteoporosis. An animal study of post-menopausal bone loss found that olive polyphenols protect against bone loss. Rats fed a steady diet of olive polyphenols avoided the bone loss that those deprived of them experienced. The animals that were fed olive oil polyphenols were 50% more likely to recover bone density than the control group.40 Human studies could reveal new therapies for preventing and treating osteoporosis. While olives have many purported health benefits, they have not been studied as widely for their biological properties as their oil. Because table olives have many of the same properties as olive oil, both offer similar health attributes, including antioxidant, anti-inflammatory, and antibacterial benefits. Both are excellent sources of oleic acid and several antioxidant compounds. Olives are a good source of vitamin E and contain vitamins A and K, important minerals (including iron, calcium, magnesium and potassium) and amino acids. One major distinguishing quality of olives compared to their oil is their high fiber content. The fat and fiber content contribute to satiety. Eating olives can also satisfy salt cravings. While there is sodium in olives, the content is often lower than many other savory snack foods. The myriad protective benefits of consuming olives and olive oil as part of a healthy diet are supported by a wealth of scientific research. New research is adding to the number of health conditions positively impacted by olives and olive oil, including conditions as far ranging as depression, cognitive function, HIV/AIDS, inflammatory bowel disease and multiple sclerosis. There is also emerging research on the probiotic characteristics of olives. Each day, more information is being discovered about how the human body absorbs olives’ diverse and numerous constituents. This information will be invaluable in making recommendations on daily dosage requirements for table olives and olive oil as well as food combinations that provide the greatest benefit to human health. 1 There is no single Mediterranean diet (MD). There are healthy patterns of eating throughout the region. For the purposes of this paper, MD refers to several diets in the region with similar health and nutritional dietary patterns, including the prominence of olive oil as the primary fat source. 2 Keys A et al. The diet and 15 year death rate in the Seven Countries Study. Am J Epidemiol 1986; 124:903-915. 3 Owen RW et al. Phenolic compounds and squalene in olive oils; the concentration and antioxidant potential of total phenols, simple phenols, secoiridoids, lingans and squalene. Food Chem Toxicol 2000; 38:647-659. 4 Extra virgin olive oils are richer in phenolic content than refined olive oils. 5 Covas MI et al. Minor Components of olive oil: evidence to date of health benefits in humans. Nutrition Rev 2006; 64:20-30. 6 Sofi F et al. Adherence to Mediterranean diet and health status: meta-analysis. BMJ 2008; 337:a1344. 7 Fito M et al. Protective effect of olive oil and its phenolic compounds against low density lipoprotein oxidation. Lipids 2000;35:633-8. 8 Covas MI et al. The effect of polyphenols in olive oil on heart disease risk factors. Ann Int. Med 2006;145:333-41. 9 Psaltopoulou T et al. Olive oil, the Mediterranean diet, and arterial blood pressure: the Greek European Prospective Investigation into Cancer and Nutrition (EPIC) study. Am J Clin Nutr 2004;80:1012-18. 10 Alonso A et al. Monounsaturated fatty acids, olive oil and blood pressure: epidemiological, clinical and experimental evidence. Public Health Nutr 2006;9:251-7. 11 Ferrara L A et al. Olive oil and reduced need for antihypertensive medications. Arch. Intern. Med. 2000;160: 837-42. 12 Kostantinidou V et al. In vivo nutrigenomic effects of virgin olive oil polyphenols with the frame of the Mediterranean diet: a randomized controlled trial. FASEB J. 2010 24; 2546-57. 13 Murie-Fernandez M et al. Carotid intima-media thickness changes with Mediterranean diet: A randomized trial (PREDIMED-Navarra). Atherosclerosis. 2011; 218(1):174-180. 14 Giugliano D et al. Mediterranean diet and metabolic diseases Curr Opin Lipidol. 2008; 19(1):63-8. 15 Perez-Martinez P, Mediterranean diet rich in olive oil and obesity, metabolic syndrome and diabetes mellitus. Curr Pharm Des. 2011; 17(8):769-77. 16 Kastorini CM et al. The effect of Mediterranean diet on Metabolic Syndrome and its components. J Am Coll Cardiol. 2011; 57:1299-1313. 17 Martinez-Gonzalez MA et al. Adherence to Mediterranean diet and risk of developing diabetes: prospective cohort study. BMJ. 2008; 336:1348–51. 18 Salas-Savado J et al. Reduction in the Incidence of Type 2 Diabetes With the Mediterranean Diet: Results of the PREDIMED-Reus nutrition intervention randomized trial. Diabetes Care 2011; 34:14-19. 19 Samieri C et al. Olive oil consumption, plasma oleic acid, and stroke incidence: the Three-City Study. Neurology 2011; 77: 418-25. 20 EFSA Panel on Dietetic Products, Nutrition and Allergies (NDA). Scientific Opinion on the substantiation of health claims related to polyphenols in olive. EFSA Journal 2011; 9(4):2033. 21 World Cancer Research Fund/American Institute for Cancer Research. Food, Nutrition, Physical Activity and the Prevention of Cancer: A Global Perspective. 2007. 22 Trichopoulou A et al. Cancer and Mediterranean dietary traditions. Cancer Epidemiol Biomarkers Prev. 2000; 9:869-73. 23 Psaltopoulou T et al. Olive oil intake is inversely related to cancer prevalence: a systematic review and a meta- analysis of 13800 patients and 23340 controls in 19 observational studies. Lipids Health Dis. 2011; 10:127. 24 Pelucchi C et al. Olive oil and cancer risk: an update of epidemiological findings through 2010. Curr Pharm Des. 2011; 17:805-812. 25 La Vecchia C. Mediterranean diet and cancer. Public Health Nutr 2004; 7:965-8. 26 Menendez JA et al. Mediterranean dietary traditions for the molecular treatment of human cancer: anti-oncogenetic actions of the main olive oil’s monounsaturated fatty acid (18:1n-9) Curr Pharm Biotechnol 2006; 6:495-502. 27 Visioli F et al. The role of antioxidants in the Mediterranean dets: focus on cancer. Eur J Cancer Prev 2004; 13:337-43. 28 Sieri S et al. Dietary patterns and the risk of breast cancer in the ORDET cohort. Cancer and Epidemiol Biomarkers Prev 2004; 13: 562-72. 29 Menendez JA et al. tabAnti-HER2 (erbB-2) oncogene effects of phenolic compounds directly isolated from commercial Extra-Virgin Olive Oil (EVOO). BMC Cancer 2008; 8:377. 30 Levi F et al. Food groups and colorectal cancer risk. Brit J Cancer; 79:1283-7. 31 Stoneham M et al. Olive oil, diet and colorectal cancer: an ecological study and an hypothesis. Journal of Epidemiology and Community Health 2000; 54:756-60. 32 Gill CI et al. Potential anti-cancer effects of virgin olive oil phenols on colorectal carcinogenesis modesl in vitro. Int J Cancer 2005; 117:1-7. 33 Hashim YZ et al. Inhibitory effects of olive oil on invasion in human colon adenocarcinoma cells in vitro. Int J Cancer 2008; 122:495-500. 34 Newmark HL. Squalene, olive oil and cancer risks: a review and hypothesis. Cancer Epidemiol Biomarkers Prev 1997; 6:1101-1103. 35 Smith TJ. Squalene: Potential chemopreventive agent. Expert Opin Invest Drugs 2000; 9:1841-8. 36 Wahle KW et al. Olive oil and modulation of cell signaling in disease prevention. Lipids. 2004; 39(12):1223-31. 37 Berbert AA et al. Supplementation of fish oil and olive oil in patients with rheumatoid arthritis. Nutrition. 2005; 21:131-6. 38 Camargo A et al. Gene expression changes in mononuclear cells in patients with metabolic syndrome after acute intake of phenol-rich olive oil. BMC Genomics 2010; 11:253. 39 Pitt J et al. Alzheimer's-associated Aβ oligomers show altered structure, immunoreactivity and synaptotoxicity with low doses of oleocanthal. Toxic & Appl Pharm 2009; 240:189-97. 40 Puel C et al. Major phenolic compounds in olive oil modulate bone loss in an ovariectomy/inflammation experimental model. J. Agric. Food Chem 2008; 56, 9417–9422. 41 Vissers MN et al. Olive oil phenols are absorbed in humans. J Nutr 2002; 132:409-17. 42 Medina E et. al. Comparison of the concentrations of phenolic compounds in olive oils and other plant oils: correlation with antimicrobial activity. J. Agric. Food Chem 2006; 54:4954–61. 43 Romero C et al. In vitro activity of olive oil polyphenols against Helicobacter pylori. J Agric Food Chem. 2007; 55(3):680-6.